David Tennant doesn't think 'Doctor Who' has overshadowed the rest of his career. The 39-year-old actor - who played the 10th Doctor in the BBC One sci-fi show - says it doesn't "occur to him" that people watching him in other roles might find it hard to separate him from the Time Lord, especially as he has continued to work with comedienne Catherine Tate, who portrayed Donna in 'Doctor Who'. He said: "I know this was said a lot when I did 'Hamlet' for the Royal Shakespeare Company, but, to be honest, it never occurred to me. I just imagined people would be sensible enough not to bring those preconceptions with them." 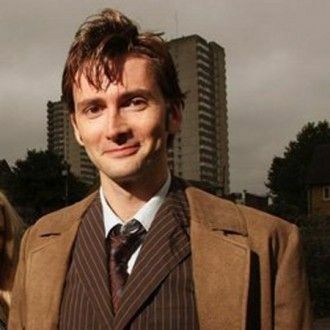 David - who is now starring alongside Catherine in a stage version of Shakespeare's 'Much Ado About Nothing'- also maintains his decision to work with the comedienne again has nothing to do with 'Doctor Who', although he acknowledges the opportunity never would have transpired had he not starred in the show. He added to the Daily Telegraph newspaper: "It would be disingenuous to suggest that the fact that this is happening hasn't got something to do with the power of 'Doctor Who' , and that's something I'm wonderfully thankful for. "But, for me, the thinking was, 'I'd like to do a play; I'd like to do 'Much Ado About Nothing'; and it just so happens that the perfect Beatrice in my head is Catherine.' That's as involved as my thought process was."